Walkthrough: Once you come to Heahea City, you will find Lillie and Kukui arrive at the docks. After doing so, you will also meet Olivia, the Kahuna of Akala Island, and Mallow, one of the Akala Island Trial Captains. Form there, you will be prompted to explore Heahea City. After meeting Lillie near one of the shops, you will be lead to the northern part of Heahea City. 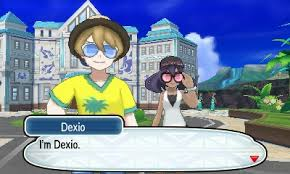 Here, you will meet Dexio and Sina, Professor Sycamore's Assistants from the Kalos Region, which will end in a friendly battle. Details: After defeating the Main Story, you can return to Heahea City to battle GameFreak's Morimoto & Iwao. You will also find the Flareon User here during your Eevee Quest.